Bledsoe, C.S. et al., 1999. Standard soil methods for long-term ecological research. In D. C. Coleman et al. New York: Oxford University Press, pp. 413–436. Fahey, T.J. et al., 1999. Standard soil methods for long-term ecological research. In D. C. Coleman et al. New York: Oxford University Press, pp. 437–455. Myrold, D.D., Ruess, R.W. & Klug, M.J., 1999. Standard soil methods for long-term ecological research. In D. C. Coleman et al. New York: Oxford University Press, pp. 241–257. Paul, E.A. et al., 1999. Standard soil methods for long-term ecological research. In D. C. Coleman et al. New York: Oxford University Press, pp. 291–317. Mulder, C.P.H. & Ruess, R.W., 1998. Effects of herbivory on arrowgrass: interactions between geese, neighboring plants, and abiotic factors. Ecological Monographs, 68, pp.275–293. Person, B.T., Babcock, C.A. & Ruess, R.W., 1998. 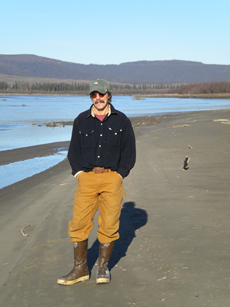 Forage variation in brood-rearing areas used by pacific brant geese on the Yukon-Kuskokwim delta, Alaska. Journal of Ecology, 86, pp.243–259. Ruess, R.W., Hendrick, R.L. & Bryant, J.P., 1998. Regulation of fine root dynamics by mammalian browsers in early successional Alaskan taiga forests. Ecology, 79, pp.2706–2720. Schimel, J.P., Cates, R.G. & Ruess, R., 1998. The role of balsam poplar secondary chemicals in controlling soil nutrient dynamics through succession in the Alaskan taiga. Biogeochemistry, 42, pp.221–234. Kielland, K., Bryant, J.P. & Ruess, R.W., 1997. Moose herbivory and carbon turnover of early successional stands in interior Alaska. Oikos, 80, pp.25–30. Ruess, R.W. et al., 1997. Growth responses of Carex ramenskii to defoliation, salinity, and nitrogen availability: implications for geese-ecosystem dynamics in western Alaska. Ecoscience, 4, pp.170–178.